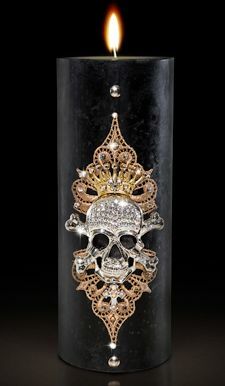 Here’s a gothic sort of candle from Lisa Carrier Designs called Luxe Crystal Skull. . It would look quite magical at a Halloween party, but it would also make a statement as an original conversation piece. Some of the famous celebrities who own Lisa’s designs include Tommy Lee, Barbara Streisand, Ozzy Osbourne, Christina Aguilera and Arnold Schwartzenegger. The Luxe Crystal Skull includes hand painted lace, a crystal skull and a studded Fleur de lis. If you’d like something a little softer, Lisa Carrier Designs carries a Victorian Botanical line (think velvet, ribbon and birds). Browse the website Lisa Carrier Designs to see the full selection of candles. You can also find Lisa’s luxurious designs at several retailers including Bloomingdales, Caesars Palace, Harrods and Neiman Marcus. Lisa Carrier’s web site does not allow you to order and I have ordered her candles on HSN. Where and how can I reach her to pursue her catalog in order to make purchases. I wish to purchase her accessories as well as her candles. I love her candles and am only interested in purchasing her candle designs. If you could assist me, I would appreciate an email from you.